An elegant yet simple lightweight dressy scarf. The main pattern is a mock eyelet cable, surrounded by a border of garter stitch and herringbone lace designed for a beautifully draping reversible lace scarf. The choice of a subtly varicolored or multi-toned yarn will introduce a rich amalgamation of gradual color changes into the lace and cable texture. 10" by 72" or length desired. 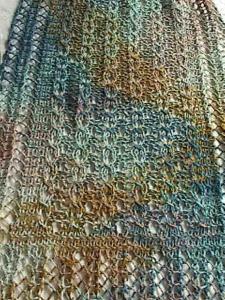 400 - 500 yards of fine yarn, approx 2 oz, 4¾ stitches/inch, size US 6 / 4.0 mm needles suggested.